The Contemporary Art evening sale at Sotheby’s in London tonight brought in £93.2 million. 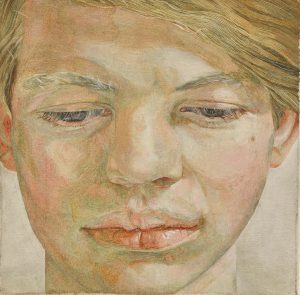 Lucian Freud’s 1956 Head of a Boy, a portrait of Guinness heir Garech Browne, made £5.8 million. It achieved the highest price for a work by the artist from the 1950s. The painting is fresh to the market, having remained in the collection of the Irish cultural patron the Hon. Garech Browne since its execution. Apex by Jean Michel Basquiat made £8.2 million and Juncture by Jenny Saville made £5.7 million. This represented an increase of over 1000% on the £457,250 achieved by this work a decade ago. The sale of 66 lots was 91% sold by lot and saw five works make over £5 million. There were auction records for Adam Pendleton, Toyin Ojih Odutola, Rebecca Warren, and for a sculpture by Martin Kippenberger.